World Premiere! Based on the book by Leslie Fram, this hilarious musical comedy follows Layla Diamond who, after listening to advice from her daffy mother, attempts to find and settle down with a divorced man. Setting her sights on a charming sports agent with a needy ex and two obnoxious children, she makes one comedic miscalculation after another and turns her marital quest into a hilarious farce. National Premiere! This hilarious, critically acclaimed Off-Broadway musical comedy is set in the 1890s and inspired by Shakespeare’s Measure for Measure. When dangerously handsome Johnny Blood must put his fate into the hands of a colorful cast of characters including a wily sheriff, an eccentric priest, an authoritarian governor, a saloon girl gone good, and a nun out of the habit, will they rise up and pull off the greatest caper yet, or will Johnny be left hanging? In this Broadway musical, the ‘Pump Boys’ sell high octane on Highway 57 in Grand Ole Opry country. The ‘Dinettes’, Prudie and Rhetta Cupp, run the Double Cupp diner next door. Together they fashion an evening of country western songs that received unanimous raves on Broadway and off. With heartbreak and hilarity, they perform highly entertaining toe-tappers such as “Drinkin’ Shoes,” “Farmer Tan” and “The Night Dolly Parton Was Almost Mine!” on guitars, piano, bass—and yes, kitchen utensils. Current Annual 6-Show Series Subscribers: Renew now through February 15, 2019. New Annual 6-Show Series Subscribers and Upgrades: Subscribe between February 19 and March 8, 2019. 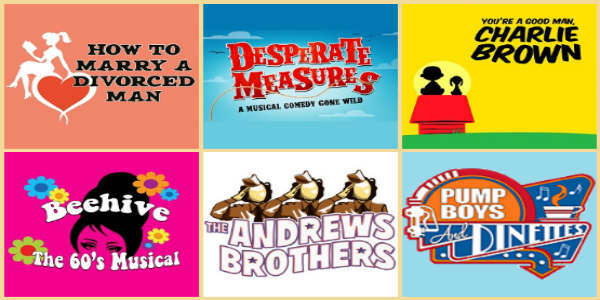 You-Pick-3 Subscriptions and Individual Tickets for all 2019-2020 musicals go on sale March 19, 2019. Please call the Box Office at 407-645-0145 for Series Subscription pricing. For more information on all productions at the Winter Park Playhouse, visit winterparkplayhouse.org.